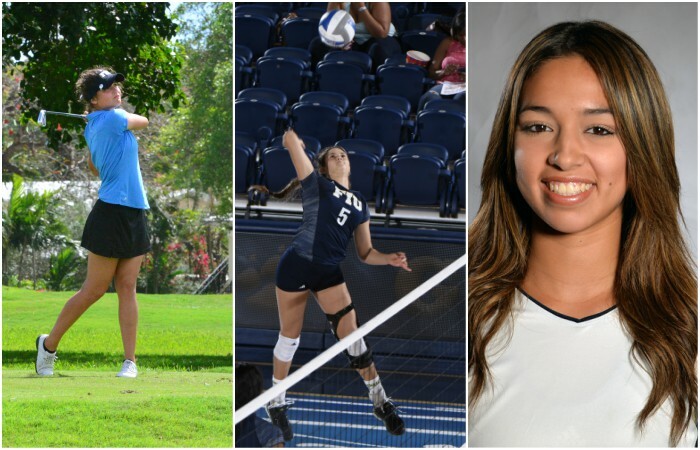 From left to right: Puerto Rican student-athletes Diana Velez, Lina Bernier and Fabiola Plaza fought through uncertainty after Hurricane Maria devastated their homeland. Photos courtesy of FIU Athletics Media Relations. As Hurricane Maria closed in on Puerto Rico, Bernier – a sophomore volleyball student-athlete born in San Juan – struggled to pay attention to her professors, her coaches and her trainers. Her mind was a thousand miles away as Maria devastated her homeland. All of the family members – her mother and father, stepmother and stepfather, brothers and sisters – were still on the island as the storm hit. She wasn’t alone. Teammate Fabiola Plaza and FIU golfer Diana Velez, fellow Puerto Ricans, endured the same agonizing experience as well. In the days leading up to Maria, Plaza did her best to send packages of essentials, including non-perishable food items and water, to family members in Ponce, a large city located on the island’s southern coast. One of the most difficult parts of the entire ordeal was not being able to communicate with them after the storm passed through. It took Velez about six days to find out anything from her family. That wait was a week-and-a-half long for Bernier. For Plaza, the silence went on for two-an-a-half weeks. “I didn’t know if they lost their houses, where they were, what they were eating… it was a horrible experience,” Plaza says. In order to get through it, Plaza relied on her faith in God and was used volleyball as an outlet to relieve some of the stress. Bernier and Plaza would also encourage one another and let each other know if they heard anything from anyone on the island. And all three could rely on teammates for words of encouragement during the silence. Velez first found out her family was okay when she got off the plane with her team in Boston for a weekend tournament on Sept. 24. When she heard the voicemail from her father, she couldn’t stop the tears. “It was really emotional, I couldn’t believe it,” Velez said. The problems their families faced back home ranged from no power and some flooding to downed trees and long lines to get gas and supplies, but, most importantly, they were safe. After the storm, each of them found a way to help those back on the island. Bernier connected with the Miami Xtreme Volleyball Academy, which was holding a relief drive for those affected by Hurricane Maria, and brought food, water, medicine and other items collected by her teammates. Velez participated in fundraisers and found a GoFundMe page called “Students with Puerto Rico,” which has raised more than $200,000 to help victims of the storm. All three are proud of seeing FIU open its doors to students from Puerto Rico by offering in-state tuition to students from the island through the #FIUstrong initiative. Approximately 200 Puerto Ricans are enrolling as visiting students and will be able to pay the in-state tuition rate through the spring semester. Velez’s cousin is applying to continue her education at FIU, and Plaza has called family and friends to let them know about university initiatives. “FIU stood up for Puerto Rico when we were in need. That means a lot to me, and I’m sure it means a lot for every Puerto Rican that goes to FIU,” Bernier said.